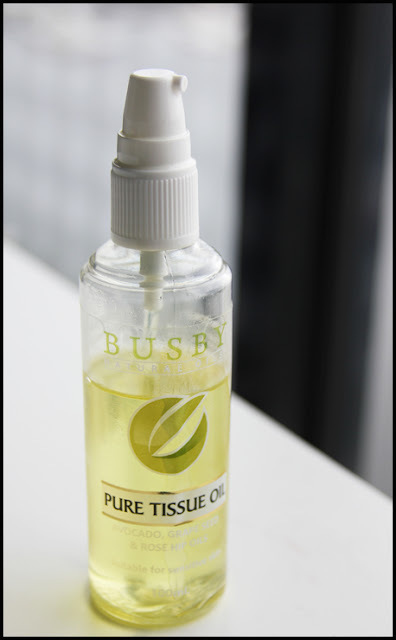 Busby: Busby Pure Tissue Oil is a clinically proven face and body oil, formulated to improve the appearance of scars, stretch marks, wrinkles, ageing and dehydrated skin within 28 days. Okay, so when I first got sent this product, I tried it out the day I was meant to leave for the Australian Beauty Bloggers Weekend. I slathered on the product, ooh-ed and ah-ed at the glow in my skin, and then started getting ready for my flight. A couple of minutes later, I started itching. I brushed it off as shaving rash, but then the itching started feeling a little familiar. I lifted my tights up to an angry, red rash on my legs. I was mortified! I jumped into the bath immediately and scrubbed off every remaining bit of the oil, and thankfully, my rash subsided almost immediately after. I'm not sure what triggered this. I know that I have had similar experiences with natural products like herbal mosquito repellent. Undeterred, (in a way), I decided to give this product to my sister to trial. Here are her thoughts. The oil is very moisturising, yet also very light. It absorbs really well, without leaving a greasy film on the skin. My sister is very particular about this, so she was glad to find that this oil didn't do that. The oil has a light, fruity scent. Very pleasant and not at all overpowering. What I like about this oil is that it contains no petrochemicals, mineral oils, parabens, or BHT. Busby also claims that the oil contains 5x more Vitamin E than any other leading tissue oil brand on the market. The packaging is plastic, with a pump mechanism that functions well. As with all oils, it gets a little messy because there always seems to be a little bit that leaks out all over the pump. She has used this for just over a month now, and she's noticed a small difference. Her skin is, of course, more moisturised and supple. She has tiny stretch marks on her legs, and she used this oil primarily to get rid of those scars. The scars have lightened a little. Nothing miraculous, but she is convinced that with prolonged use the scars will lighten even more. The Busby Pure Tissue oil retails for AUD 17.95 per 100ml at selected pharmacies.